Samsung launches Galaxy Ace Style smartphone | What Hi-Fi? 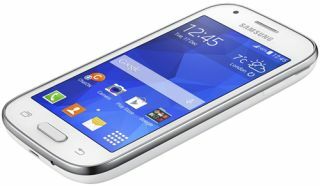 Samsung has announced the launch of its new Galaxy Ace Style smartphone, which is aimed at the affordable end of the budget spectrum. It boasts a 4-inch 480x800 LCD touchscreen and 1.2GHz dual-core processor with 512MB of RAM, with the Android 4.4 KitKat operating system and Samsung's TouchWiz UI also featuring. Elsewhere, there's a 5MP rear-facing camera, 1500mAh battery, Bluetooth 4.0, HSDPA, 4GB of interal storage and a microSD card slot that supports up to 64GB. While it won't tempt buyers away from the incoming Samsung Galaxy S5, the Korean manufacturer will be hoping the Galaxy Ace Style will rival the Motorola Moto G. The Motorola however, supports 4G connectivity. The Samsung Galaxy Ace Style is expected to go on sale this month in cream, white and dark grey finishes. Pricing is yet to be confirmed.